First and foremost (before I forgot), there's an amazing concert happening this Saturday in Lexington, KY. Cory Hanks, bassist for Those Crosstown Rivals, and Michelle Evans, writer for this blog's inspiration Ninebullets.net, are having a post-wedding party with their favorite bands. You should go help them celebrate! 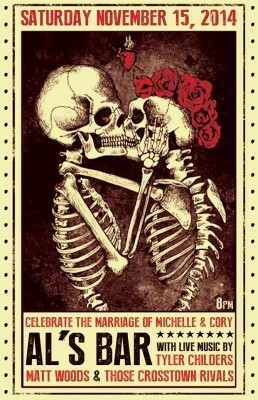 Congrats, Michelle and Cory! So let's talk about Son Little. If you're someone who listens to lots of public radio, you almost certainly know who I'm talking about. After all, NPR can't stop spinning his new song "The River." While "The River" leads listeners to believe that Son Little is the blues' second coming (and we'd all be forgive for that. Damn! That voice!) the album is more heavily influenced by reggae and R&B, as can be seen on "Your Love Will Blow Me Away When My Heart Aches." Things I Forgot packs an astonishing breadth and depth in its compact six songs. There's no question Son Little is way more than the sum of his parts: singer, songwriter, producer. He's an artist in the truest sense. Even if you don't love all of the songs on the EP, you'll love seeing and hearing an artist flex his considerable talent.